So here I sit, on a very rainy day looking out of my eighth story office window onto the city of Washington D.C. It is my last day in the office before embarking on a journey to Tennessee, Kentucky and many other states to follow. I’m a little nervous about catching flights, getting stuck in traffic, remembering about a time change and finding my way around unfamiliar campuses, but I am completely confident in the message that I get to spread while I am on the road (and that Matt told me if I need information, to call him because he’ll be sitting at a computer anyway- Thanks Matt!). If anyone had told me five years ago what I’d be doing now, I would have told them that they must have been mistaken. Five years ago, I was a college freshman at the University of New Hampshire, majoring in classical vocal performance and my plan was to become an opera singer. But something happened later that year that would change that plan and my life. That something was an alternative spring break trip to Nazareth Farm in West Virginia. I was hesitant to go at first. 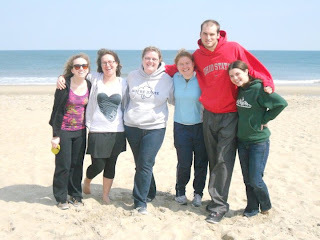 I thought I wanted to return home to Chelmsford, Massachusetts and see my high school friends, but my parents encouraged me to participate, knowing how much I enjoyed the volunteer work that I did with my church in high school. 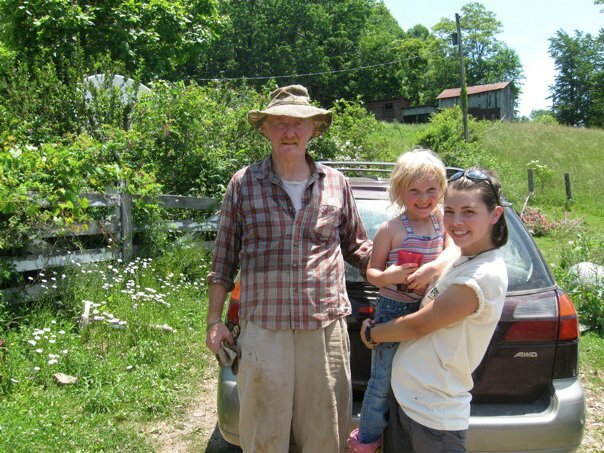 Nazareth Farm is an intentional living community that provides home repair services to residents in the area who are struggling for financial resources. While there, I fell in love with the Appalachian people and region and wanted to find a way to spend more time there. My campus minister suggested that I look into Nazareth Farms’ sister farm, Bethlehem Farm. In the summer of 2008, I volunteered as a Summer Servant for two months at Bethlehem Farm and have returned every summer since. The communities at Nazareth Farm and Bethlehem Farm live by the four values of Faith, Community, Service and Simplicity. Living by these values challenged me to grow in understanding of myself, my world and my relationship with God. I had friends who volunteered abroad and I eventually went on an alternative spring break trip to Honduras. There are some people who argue the importance of domestic vs. international service, but I learned that one is not greater than the other because there is great need both within the U.S. and abroad. We, as individuals, are called to discern where our talents, strengths and passions lie and how they can be put to best use. So when it came time for me to decide where I wanted to do a year of service after graduation, I knew I wanted to stay in the U.S. but I wanted to diversify my experiences. Therefore, I went searching for a program that lived out Nazareth and Bethlehem Farm’s values in an urban setting. Fortunately, all of Catholic Volunteer Network’s programs abide by these pillars, so they made my search easy. I applied to several programs and ultimately decided on Catholic Charities Project S.E.R.V.E. in Baltimore, Md. As a Project S.E.R.V.E. volunteer, I lived in intentional community with five other people in downtown Baltimore and we each worked at one of Catholic Charities 80 programs. I served as a caseworker at Sarah’s House, a n emergency shelter and transitional housing for homeless families. As a caseworker, I met with families at least once a week and put them in touch with services and resources to help them get back on their feet. Some of these services included; mental health counseling, substance abuse counseling, legal assessments, employment placement, medical services, DSS benefits and so much more according to the need of each client. I was also Family Literacy Coordinator. Family Literacy was a weekly class that provided an opportunity for parents and children to have fun learning together. Many of the parents at Sarah’s House were so wrapped up in getting back on their feet that it was difficult to spend quality time as a family. In the class we read books, did crafts, played games and sang songs according to a theme of the week. I write about these roles now as though they were second nature to me, but they were not. I was a music major and had no background or experience in social services or teaching. It was a very steep learning curve with many challenges, but I learned more from my experience than I could ever imagine. I gained confidence in my abilities, understanding of how to sustain a simple lifestyle, a deeper relationship with God and five new extended family members otherwise known as my community. These aspects combined to help me discover my true self and vocation to service. It is with this fire in my heart that I venture out to campuses across the United States to spread the word about service. I hope that those I meet will be inspired to open themselves up to all the gifts that faith-based service has to offer (and that there will be less rain when I leave the east coast).